Listening to Trump reminded me of Chamberlain waving his letter from Herr Hitler and announcing peace in our time. I wouldn't trust the little fat fook further than I could throw him. My primary concern is as follows: is whatever Trump and Kim arrived at something South Korea is comfortable with? Clever guy this Kim. Pose a threat, real or otherwise, hook, line and sinker. I'm pretty sure you're damned close to the truth. Time will tell, but I can't help but think that Kim is a damned sight smarter than many think he is. I worked South East Asia for more than 10 years, mainly China, but also South Korea. I negotiatet contracts for major infrastructure projects and my opponents came from central and province government, to city mayors, central and local banks, import/export units and design bureaus. A typical project took 5 weeks of final negotiation, that was after maybe 12 months of preperatory talks. We won every contract, but we never left the table as winners. I never assumed anything, and I never underestimated my customers. Indeed, While of course SK and the U.S. are in the inner sanctum of what is going on here, let's not forget the Japanese and other allies in the region. Perhaps I was wrong, but I thought that one of the longer term goals was if not to completely contain Chinese influence, then at least try to manage it through alliances both formal and informal. Others do look to the United States for leadership so I would hope they would not send the wrong signals of who can be trusted or not. Tough work to be sure. The little fat one will see it as a coup, he has had the US president fly to see him on his "patch" even though in a supposed neutral country it is still his "patch" in distances covered. Personally I think with sanctions biting and thus revenues to the Country significantly impacted upon, Kim was on a back foot and worried for his own neck from his higher echelons who he is struggling to keep in the lifestyle they have become accustomed too as his countries revenues have been depleted by his nuclear aims, top that off with the fragile state of his nuclear test facilities mountain and its potential to collapse leaking radiation into the atmosphere, the offer to destroy the facility may simply be a ruse to show willingness, while destroying a facility no longer viable, that and if the press is believed he has the weapon developed sufficiently that it is no longer required. I also think Trump is a fool, the reason the US maintains troops and practice with the south and contribute to NATO is nothing to do with cost, but to maintain a balance and also a buffer to prevent the opposition knocking on the door of the good old USA. I suspect Kim doesn't want to get bumped off by a relative who decides their standard of living could be better with the West. As I understand it, North Korea has been trying to 'come in from the cold' for years, but Trump is the first President who's willing to make a deal with them. Maybe it won't work, but it's still worth giving peace a chance. Well, SK was blindsided by the announcement of the cessation (at least temporarily) of the joint military exercises. After passing a trillion dollar tax cut I guess this is the best way to, as Mr. Trump alludes, save a dollar here and there. Of course you do because it follows your hatred of Trump, not because it’s founded in fact or informed opinion. You’re exercising a pragmatic view, that’ll never be accepted by the anti Trumpers. While the sane world is willing to sit back and see what develops from the seed planted in Singapore, the loony left has run out and bought a bottle of weedkiller. Two years ago an American student who tried to collect a souvenir of his visit to the Democratic Peoples Republic of North Korea was arrested, put on trial, and sentenced to 15 years hard labour. He should have received the full protection of the most powerful nation on earth. His home country. The United States of America. Instead he was so badly treated by the authorities in North Korea that his health deteriorated and he died after early release. 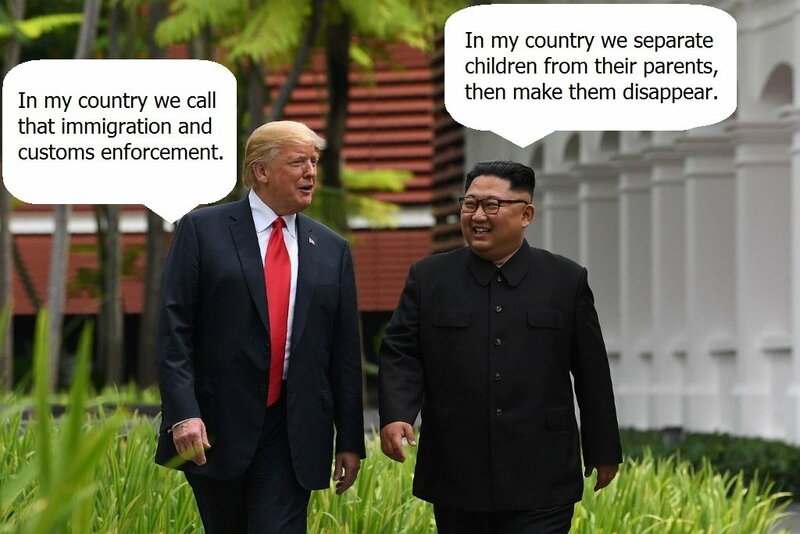 The leader of North Korea had it within his power to intervene and show humanity, but instead exploited the situation in the most public way possible. Yesterday, an American president came to the negotiating table offering concessions, and praise for a talented young man who loves his country. Not the talented young man who pleaded for clemency at his show trial, but the "talented young man" who staged that show trial and humiliated the United States of America. SINGAPORE (AP) - The parents of Otto Warmbier, the American college student who died after being released from a North Korean prison last year, are thanking President Donald Trump for his kind words about their son. Fred and Cindy Warmbier said in a statement on Tuesday after Trump met with North Korea's Kim Jong Un that they appreciated the president's comments. They said they were hopeful that something positive could come from the summit. Earlier in Singapore, Trump said that Otto Warmbier was a "very special person" and that his death had galvanized the administration's determination to deal with North Korea. Trump said Otto Warmbier had not died in vain. Warmbier was a student at University of Virginia who was arrested by North Korean authorities in January 2016 for stealing a propaganda poster and sentenced to 15 years in prison with hard labor. After suffering still unexplained brain injuries, he was released on June 13, 2017 and died six days later. FOCUS on the words spoken by your commander in chief at that press conference. That's simply untrue; I think you may well be mistaking me for someone else. I neither hate Donald Trump or have any particularly strong views about him. I have expressed the view, back around the time of the US Presidential election, that US voters had a choice between two poor candidates, but that's all. I've stayed out of debates about Donald Trump, with the exception of highlighting how his behaviour is perceived by many around the world, based on the way he uses social media. I'm not convinced that "international diplomacy by Twitter" is the best way to maintain good international relationships, but that does not in any way translate into hatred. Go review my past posts if you don't believe me. Are you referring to me? If so, I don't have a "commander in chief"! You better not let the wife hear you say that! Looks as if there might be a second meeting. North Koreans seem, however, to be working full apace on their overall nuclear and missile programs. Not a news source I would have thought of - Vanity Fair and given their website performance - won't. North Korea's only official nuclear enrichment site at Yongbyon is being upgraded. The country is stepping up enrichment at two or more secret sites besides Yongbyon. Pyongyang continues to produce more mobile launch vehicles for its ballistic missiles. It has also expanded missile production of solid fuel engines which are more mobile and easier to launch. How reliable are these reports? They are "only" reports but they are deemed accurate by respected North Korea watchers. The information is based on multiple unnamed sources from the US intelligence community as well as the 38 North study of satellite images of the Yongbyon site. Got to wonder if there is the slightest bit of real commitment or the silly dance is going to continue? NK is still drawing cards to play a bigger stake during the final negotiations to come. I'm not sure when the top of the curve is before they must agree formally to something measurable 3 mos? 6 mos? The reverse side is when will the US say "times up" and what does that entail?